Native Mi’kmaq people inhabited this scenic glacial valley many thousands of years before the arrival of the Europeans and continue to do so today. The tidal river that they called “L’sitkuk Elsetuk”, provided easy travel to the coast where they harvested various fish and clams. Inland they hunted abundant wild game, including caribou. During a severe winter storm (around 1605-9) one of Champlain’s supply ships in command of Simon Imbert took refuge here and thereafter the river bore his name. Following the French Expulsion of 1755 the English settled the land and then call the river Bear – a corruption of Imbert. Among the first European settlers (1783) were German mercenaries known as Waldecians and Hessians. Other settlers that followed included the names Chute, Rice, Miller, Clarke, Troop, and Harris. The land lots purchased by many of those families are still in evidence in the community. Due to the shortage of suitable level land, the downtown area was largely built on piers and stilts or on artificially created land supported by retaining walls. The high river tides (7m) combined with an abundance of easily accessible mature oak and various softwood trees made shipbuilding and lumbering two important and profitable industries. Markets were readily found in the West Indies, England, and North America. 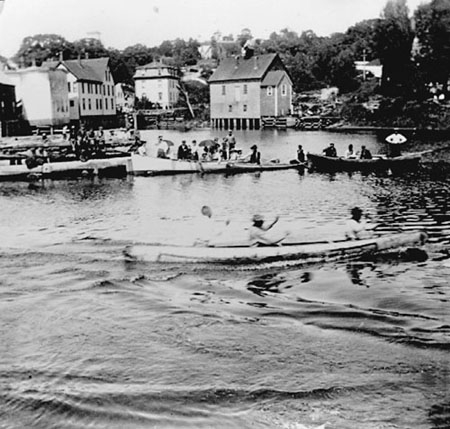 In its hey day (1890’s) Bear River had six shipyards and six lumber mills even though its population was only 1200. With the affluence so generated, many shops, supply stores, and service centres were established. Many large, elaborate homes were constructed along the steep hillsides on both sides of the river. 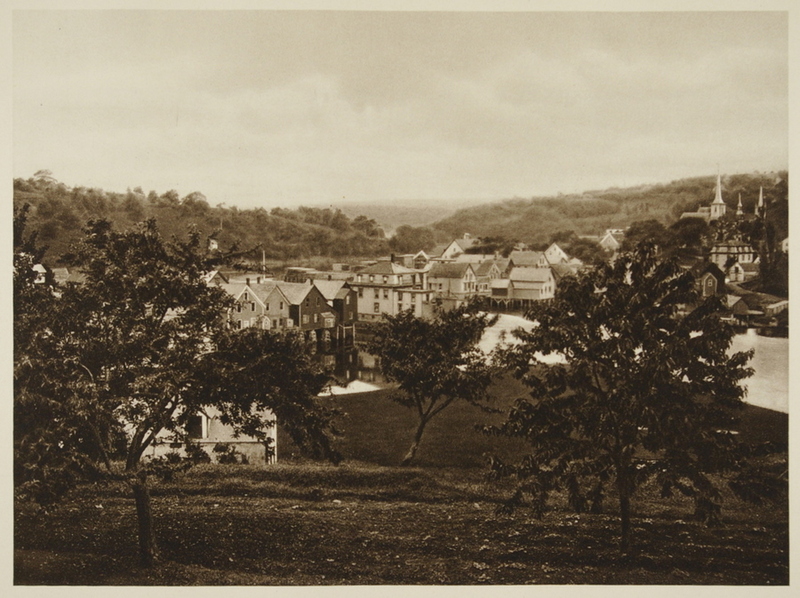 Later, visitors would refer to the area as “The Switzerland of Nova Scotia”: a name by which it is often described to this day. Various wood articles were produced at Bear River in the 1800’s and early 1900’s. These include hogshead staves for the local and export market, barrels for the sugar refineries at Moncton and Halifax, and barrels for the apples and other fruits locally produced. Block making and wool carding as well as specialized sawing made to order were other occupations of these industrious people. The Clark Bros., among their many enterprises, catered to hunting and fishing parties but their biggest single endeavor was their sawmill and woodworking plant at Lake Jolly, about 14km South East of Bear River. Here they produced spruce and pine lumber as well as shingles and box material. The mill was later converted to handle hardwood and produced dowels, clothes pins, window sashes, door frames and toy furniture. By the turn of the century steam engines and steel hulls signaled an end to the age of sailing ships and the people turned to logging as their primary source of income. The influential Clarke family even promoted a pulp mill for the area (1919-1920). Since then much has been done to cater to the tourist trade which is now the main industry of the region. One of its primary undertakings has been a waterfront development project including a peace park complete with picnic tables overlooking the river and a tourist information centre. Another unique endeavor has been the construction and operation of a solar aquatic sewage facility. Village sewage is treated using aquatic plants, bacteria, in a greenhouse enclosure. An increased awareness of the environment and ecology has resulted in a large increase in the number of striped bass and salmon returning to the river each year. 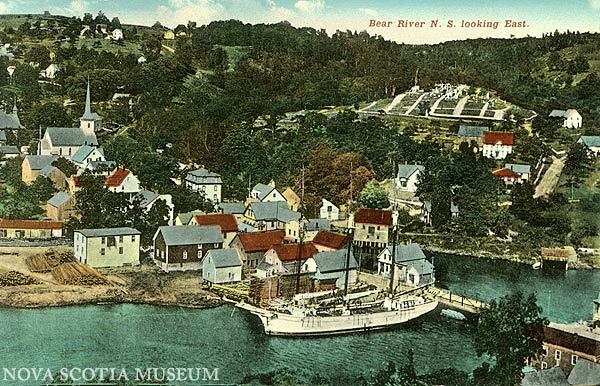 For more Bear River history, visit the Bear River Historical Society website. SAWPOWER: Making Lumber in the Sawmills of Nova Scotia by Barbara R. Robertson. A co-publication of Nimbus Publishing Ltd. and the Nova Scotia Museum, Halifax, Nova Scotia, 1986. Crown copyright, Province of Nova Scotia, the Department of Education & Nova Scotia. Just dropping a note to congratulate you on a well-done web site. I like the concise and readable Bear River history. The pictures help make it real. Now I’m off to learn more at the Bear River Historical Society website. Hi, and please let me first say- Flora, your responses to questions are just fantastic! I read through them and you make everyone feel so welcome. On that note, :-), I was hoping you could assist me as well. I tried the link for the Historical Society’s database but it doesn’t work. I have his parents (possibly erroneously) listed as Benjamin J Rice (b. 28 Feb 1823, d. 13 Oct 1902 in Bear River) and Elvira O’Dell (Odle) (b. 28 July 1826, d. 17 Apr 1867, also in Bear River). I’ve checked the Edmund Rice Association for their names and they do not come up. I am trying to find (check) a link between Bernard and William Rice (b. 24 Jun 1774, d. 27 Nov 1833); the current link is not checking out via ERA. Welcome to the site and thank you for your kind words. To learn more about the early descendants of Edmund Rice visit the Edmund Rice (1638) Association,. [S1376] McCormick 1975, pp. 61, 90. [S1376] McCormick 1975, p. 61. [S1433] Annapolis County Marriages, 1864-1910, LDS film number 1298863: p. 164, no. 19. [S1376] McCormick 1975, p. 90. [S3] Rice Gen’l Register, pp. 119, 206. [S3] Rice Gen’l Register, pp. 119, 205. [S1293] Church of Jesus Christ of Latter Day Saints, IGI. [S1397] Wayne W. Walker, Walker – Rice Notes, Chute genealogy. You are fabulous! Thank you very much. Maybe one day I’ll get to Canada and see where they all came from. I wonder if there are still any descendants living there….. I hope you do Lisa! There are many Rice families in the area. I’ll forward this thread to a couple who I know and see what they have to say about it. It’s kind of cool to hear from someone in Alaska. Looking for an email for Ray Riley. He mentions my family in his essay..in a nice way. Yes, thank you and we have been in touch several times. FYI my maiden name is Mayo. No, we would not have been related. Hi my husband family (Harris) came from Bear River. The last name I have been able to trace is George Canning Harris. A document I found on the internet said that he was part of Orangism and the meetings were held in his barn loft which still stands today. We will be in the Bear River area this summer for a day or two and I am hoping to be able to do some research, perhaps even locate the homestead. I believe there may be family still living in Bear River. Any advice would be appreciated. Taunya Harris of Bear River or Brian Harris of Marshalltown have the family tree for the descendants of Samuel and Sarah Harris who arrived from Massachusetts between 1760 and 1765. Thank you for your response. Samuel & Sarah is the family that I am researching. I will be up there the 1st week if August. I would love to meet up with family! I am inquiring about my grandfather, Rutherford Smith. I don’t know how many siblings but I do know that he had a sister, Abigail. He was a descendant of the Catherine family – originally from Northern Ireland. In the late 1800’s he came to Rockport, Massachusetts and married my grandmother Lizzie Poole Smith. My father, Leland P. Smith was born in Rockport in 1904. Is there anyone that can tell me when the Catherine family came to Nova Scotia? This is an excellent site for information on Historic Bear River. I was hoping someone could provide information on a a man named Herbert Elroy Rice. He is a distant relative but I have heard he is from the Bear River Area. I understand he was born in 1905 and died in 1974 married to Emily Hall and then Jessie Dunphy. He was an apple grower and was renowned for the cider he made from it. He was also rumored to have fathered 17 children! Any information would be helpful. I found this on the internet. Please check out the Bear River Museum web page. http://bearriverhistory.ca They have some great links to local genealogical sites there. [S1376] McCormick 1975, pp. 92, 128. [S1376] McCormick 1975, p. 92. [S2344] Timothy L. Sanford, “Rice Divorce Records”, E1628/1948. [S1376] McCormick 1975, p. 128. Herb Rice, Jesse Dunphy and their kids were neighbors of mine when I was growing up in Bear River. They lived down the Kniffens Hollow Road, just over the first bridge. One of their boys, Clarence, was a very good friend of ours. He and his brother Lawrence were killed in a car accident several years ago. One sister lives in the Bridgetown area, a brother lives in Labrador, another brother in the Annapolis Royal area. Not sure where the others are, and I do believe there were 17. Hi….I am trying to locate some family history on a William Harris who resided in Bear River in the 1880’s, 90’s…. He had children in Yarmouth, and also in USA and traveled from Yarmouth to Boston for visits. Hello Wanda. Thanks for writing. Have you visited our ‘sister’ site, the Bear River Historical Society? There was another query about a Bill Jones and you can read the thread here: http://bearriverhistory.ca/contact/#comment-9 Perhaps this is the same Jones? Lovely to read all this information. Our family is thinking of moving to Bear River in 2 months but not sure about schools or commute time to Halifax. Any ideas? It takes about 3 hours to drive to Halifax. There are schools for K-12 in Digby (15 min) and in Annapolis Royal (25 min) and school buses to get there. The closest Universities are St. Anne’s in Church Point (45 min) and Acadia in Wolfville (75 min). There is a community college in Middleton (40 min). Have a good drive here Elizabeth! I am doing some research, trying to find good examples of abandoned rural schools that have been turned to community use. My organization (www.theciel.com) assists rural communities with local economic self-reliance. We are based in Nelson, B.C. I have discovered Oakdene Centre, but I have not been able to find anything on the net about the history of it. If someone could direct me to something on the net or give me the name and phone number of someone I could call, I would appreciate it. You can reach me at bmetcalfe@theciel.com. I have forwarded your message to the current chair of the Oakdene, Linda Mae Findlay and Board member Robbie Bays with a cc to you. There is a little bit of Oakdene contact info under the ‘organizations’ tab on this website. Hello, This is a great site. I am trying to track down information about my relatives Quigley from Bear River. I was actually on here trying to figure out where the Quigley House was located. I have a picture of it and a description of the location 50 meters south of Harris Brook Bridge. Great site. I am researching my family and found they lived in Bear River in the 1920’s and was wondering where I may find records of their births and deaths. I was planning on visting Bear River this summer and was hoping to do some more reseach. Hi Diane, I have forwarded your query to our local historical society. Checking online, I see there is a site called Nova Scotia Genealogy Records Online. http://www.genealogysearch.org/canada/novascotia.html Perhaps you can find more information there. Because Bear River straddles 2 counties, Annapolis and Digby, the records may be in either place. Hello ,I too have ancestry from this lovely part of the Maritimes!! !Or line came north to Cape Breton around 1800. I just recently arrived back at the Bear River website site to finally download several years of “The Tributary” only to find the website changed (its excellent!!) but only the recent issue available. (OK, I should have downloaded them before but in our older years we procrastinate a bit more!!!). In any event, can I convince you/someone to put them back up?? – I’m sure the file is still sitting intact on someone’s computer. They are a real plus for those of us now ‘from away’ who try to keep some connection to the river and the valley and those two tides a day! Ray, read your story on Growing up in Bear River. Printed it off for my sister, Doris, and our Uncle Harold Porter, to read. Enjoyed it very much. I enjoyed following your excurtions in around the village. I worked at The Northern Miner as a receptionist in 1988. Ray, I came across your excellent webpage about the history of Bear River and wondered if we could link to it here on our site? There are lots of old apple trees around Bear River; some of them quite ancient; some of them abandoned. We have a few trees on our land that I’d love to get identified. I know we have Gravenstein, which is a Nova Scotian variety. Delicious like a mac, but a good keeper over the winter and good for baking. I’m going to alert the Clark descendant here in Bear RIver. Perhaps he knows the answer. I’d love to know more about the reference that you found. Mr Clark didn’t have the apple tree that was with somebody else, I wonder if that orchard still exists ? I don’t think this ever made it into a commercial nursery. It is more likely to be in a private collection, locally. The gents name was Me Clarke, who from reading these pages seem to be a local family. As a transplanted Brit, I am very interested in heritage fruit trees from the UK and also our adopted region’s apples, but have never come across such a variety. The main area for apple growing in Nova Scotia is further east along the Annapolis Valley. Or you could try speaking to Jim Inglis, an organic apple grower from Bridgetown, NS – (902) 6652427. I have a selection of heritage apples on order for this autumn from Siloam Orchards in Ontario, so that we can start our own Heritage Orchard right here. For more information from them you can e-mail mail@siloamorchards.com. I’m an Heritage apple historian and grower in the UK. I recently came across an article that mention a very unusual apple in relation to your village. This apple was Goldren Russet on one end and Boston stripe on the other. The split was horizontal. I’m interested to know of this local apple still exsists or if anyone knows any more about it ?